In keeping with the whole Beatles buzz this week due to the release of their remastered CDs and video game, today's video is from a group whose name was inspired by John Lennon's Imagine. 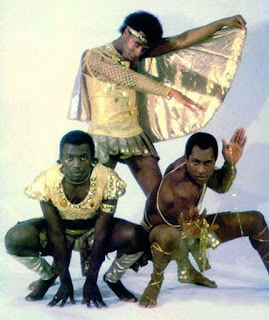 Imagination was a British trio from the early 80s that delivered some pretty cool R&B mostly while dressed in really retro gladiator style outfits. I'm not kidding. Their songs charted in 28 countries and they produced three platinum records, nine gold and a dozen silver ones all in the span of three years. Not bad considering many people in North America never even heard of them. "Just an Illusion" was their highest ranked U.S. single at 27 even though it reached #2 in a few countries including the U.K.